Psycho Educational Society (PES), founded in 1982, addresses the needs of the rural poor in Uttar Pradesh. The Society was named in tribute to the work of its founder, Dr. Paliwal, an eminent psychologist at the time. The primary focus of the organization is education of the village children. For this purpose, PES has set up a school which currently caters to 464 students, and is now being expanded to accommodate more students. Children from neighbouring villages are also transported free of cost to the school, as there are no affordable educational facilities in the vicinity for these children to access. PES gives special attention to child labourers that work in the fields, providing them with free education to encourage them to attend school. Weekly adult education classes are also conducted, and vocational training is additionally provided to the village women to help them supplement household income. Thus, PES provides essential support to the rural population, which they may not have had access to otherwise. Total Income: The total income of PES in FY13 amounted to Rs3.4mn, which was a 12% drop from that of FY12. This is mainly attributable to the 29% decrease in donations from individuals, which is the leading source of income for PES. Individual Donations: Income from this source amounted to Rs2.1mn, which formed 63% of the total income of PES in FY13. Beneficiary Fees: The second largest source of income for PES is that of tuition fees from the school, which are paid by about 80% of the students attending. 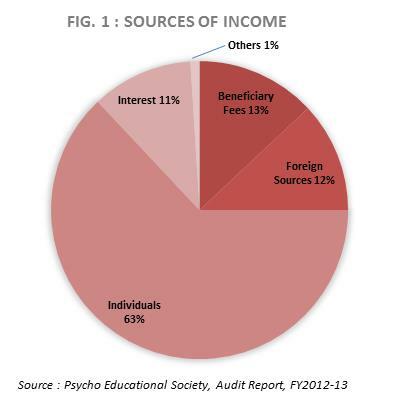 The fees raised in FY13 amounted to Rs0.45mn (13% of total income). Although income from fees is a steady source of funding, PES cannot increase the level of fees to meet their program expenses, given the financially underprivileged background of the students, and therefore, continue to rely on external funding. Program vs. 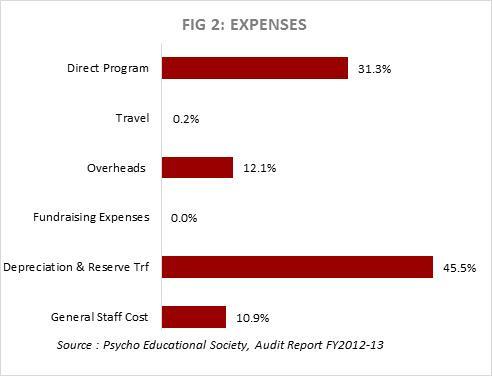 Overhead Expenses: Direct Program costs formed just over 31% (Rs0.83mn) of total expenditure, while overheads formed around 12% (Rs0.32mn). However, the largest fund utilization in FY13 was the transfer of Rs0.85mn to reserves, which is being set aside for the expansion of the school (31.8% of total expenditure). Depreciation formed almost 14% (Rs0.37mn), being mainly depreciation on school building (0.26mn). For a more normalised analysis of the total expenditure, i.e. not considering the transfer to reserves and depreciation, the expenditure on direct program activities amounts to 57%, while overheads and general staff costs amount to 22% and 20% respectively. It may be noted that overheads for organisations that build and run schools tend to be high owing to costs such as electricity, maintenance, etc. Fixed Assets: Fixed Assets held by the Trust amounted to Rs3.3mn as on the FY13 year-end, of which 78% (Rs2.5mn) is the value of the school building constructed by PES. The school is still in the process of being expanded; approximately 3,000 sq. ft. are scheduled to be built in the near future. Investments, Surpluses and Reserves: The surplus recorded in FY13, after transfer to reserves, amounted to Rs0.7mn, which is just over the Rs0.66mn average of the past four years. The total balance of reserves as on FY13 year-end stood at Rs8.2mn. Investments in the nature of fixed deposits amounted to Rs4.2mn (35% higher than that of FY12), while cash and bank balances amounted to around Rs1mn (18% lower than FY12). Income Growth Rate (IGR): FY13 witnessed a 12% decrease in the IGR, whereas in the previous two years the IGR was 19% on an average. This is due to the 29% decline in funding from individual sources. PES does not conduct any fundraising activities per se, probably due to its location, and relies mainly on references and the Trustees’ network to raise funding for the program. As a result, the income from external sources tends to waver from year to year. Self-Sufficiency Ratio (SSR): PES has a very healthy SSR, which indicates a strong ability to cover its cash expenses from stable sources of income such as beneficiary fees and interest on investments. Additionally, since most external funding comes from individual sources, there is some assurance of covering the basic program expenses. The SSR has been about 118% on an average over the past four years. Fundraising: Like any modestly-sized rural NGO, the biggest challenge for PES relates to creating visibility and raising funds for its programs. Funds so far are raised only through personal networks and by school fees. As a result, they are able to pay only low salaries to their teachers, which poses a risk of increasing the attrition rate. School drop-outs: The rate of school drop outs in the area is in the range of 10-20%, and gets higher as children grow older. To provide incentives for students to stay in school, PES provides winter clothes, free transport to school, etc. However, attendance still remains a challenge, especially among the children who work in the fields and/or come from poorer backgrounds. Lack of proper accounting support: PES is registered under the FCRA, and therefore requires professional accounting support. However, cost for the same is very expensive due to the lack of local resources. The Board of PES comprises doctors, industrialists and educationists, all of whom actively participate in the functioning of PES, either through program activities (school, health checks, etc.) or by raising funds through networking and personal contributions. PES is currently registered with the Credibility Alliance and with Give India.